As I sit here drinking coffee on a cloudy and rainy Saturday morning I haven’t yet decided if I’m going to brave the elements on the road or ride in the comfort of my garage. I hate riding the trainer so I’m thinking the road is going to win this one. Of course Sherry pointed out another option. I could skip riding all together and just hang out, read and keep drinking coffee. In reality, that’s not an option because I have targeted some big rides with even bigger climbs for this year. Here’s what I’m thinking about so far. Now, admittedly some of these may not happen but this is what I’m considering as of today. April 13th – Bottega Gran Fondo with 75 miles with 3,700’ of climbing. I have already registered for this event, which is why I need to keep training. May 10th – Tour of the Unknown Coast with 100 miles and 9,400’ of climbing. This is promoted as California’s toughest century and a ride I’ve always wanted to do. June 8th – Mendocino Monster –with 97 miles and 9,200’ of climbing. This is another ride I’ve considered for years. June 21st – Terrible 200k with 121 miles with 10,000’ of climbing. This is the second half of the Terrible Two (200 miles) and the part I didn’t ride in 2008 when the heat prevented me from finishing the entire route. 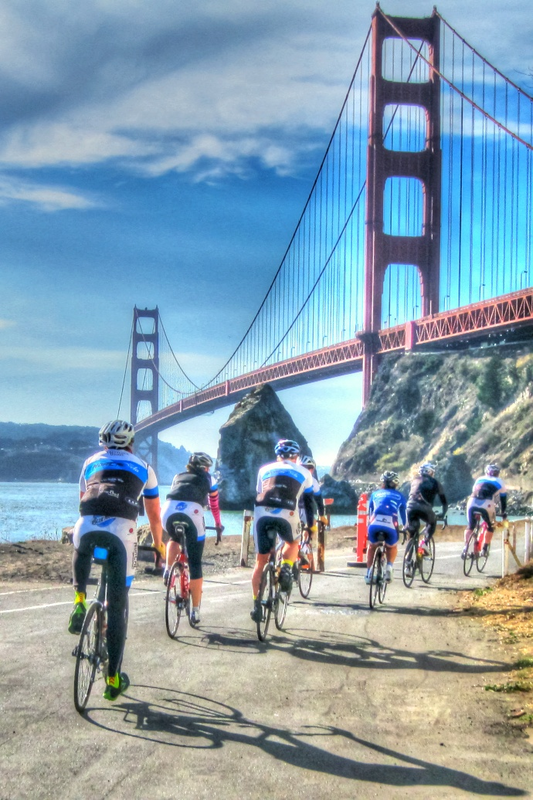 October 4th– Levi’s Gran Fondo with 102 miles and 9,600’ of climbing. I am already signed up as a volunteer ride Marshall for this ride. You can see from that schedule why skipping today’s ride isn’t an option. At the beginning of the year I needed base miles, which I started building nicely in January and early February. Now, I need base miles on climbs. So, how does one transition from flattish routes to climbs without killing yourself? The answer is hill repeats. Fortunately, I live in an area that gives me ample opportunity for hill repeats. I even have 2 options. The first is to climb a hill and then circle around and climb it again (and again and again). These are great training workouts and I do these types of rides during the week either before or after work. The second option is actually the one I prefer, which is to ride a route that has multiple climbs. To be successful, there cannot be any monster climbs just lots of little ones. The monster climbs come later. The goal is to work hard on the climb, recover on the descent, and repeat on the next climb. And, that’s exactly what I did last Saturday. I am calling last Saturday’s ride the Ride of the 10 Climbs. As you can see from the profile I constantly going up or coming down. I actually ended up with 3,500’ of total climbing. I will definitely ride this again. Maybe I’ll even go the other direction next time just for fun. I guess it’s safe to say that the serious training for 2014 has begun. I enjoyed my time building my overall endurance with base miles but now it’s to time to kick things up a notch. And, going up is exactly what I am going to do. Yes, Hill repeats. I enjoyed my time reading your schedule and intention for cycling. I really value your opinion on riding bikes.